I think it is the Holiday Inn which has the marketing tag line: The best surprise is no surprise. When it is a good surprise though (like a chocolate on your pillow) one’s heart cannot help but do a little happy dance. The last week has been full of happy surprises. Inspired by Linus Mulherin and hosted by the Prefects and Mr. MacLean, Monday night’s Haunted House in the Athletic Centre was sensational. Imagine yourself being greeted by a psychiatric nurse (Joanna Bond) and being led through a tour of an asylum by a team of schizophrenic orderlies and lunatic inmates in the dark recesses and underbelly of the Athletic Centre. One change room had been transformed into an operating theatre. Between flashes of strobe lighting one was assaulted by the screams of the poor patient (Rayannah Hwang) and the hideous cackles of her surgeons. My spine shivers with the memories. I should never be surprised again by the thought and effort our food services put into the feasts we enjoy, but Tuesday’s Halloween spread quite literally ‘takes the cake’. I took photos to share with you which you can see below. 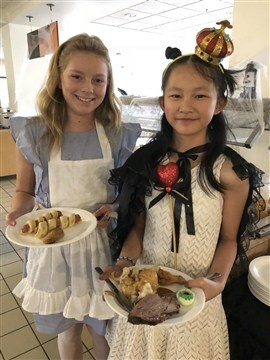 How much fun it is for everyone when the kitchen staff are all dressed up and the Dining Hall has been transformed into a festival of ghoulish and gastronomic delights! Our dance troupe became a flash mob during Tuesday night’s dance, jumping on stage and performing an original zombie inspired interpretive dance. I was happily surprised to see everyone on stage, including faculty member and dance coach, Ms. Cummings. Also surprising has been the number of guests joining our evening training sessions for Mount Kilimanjaro. 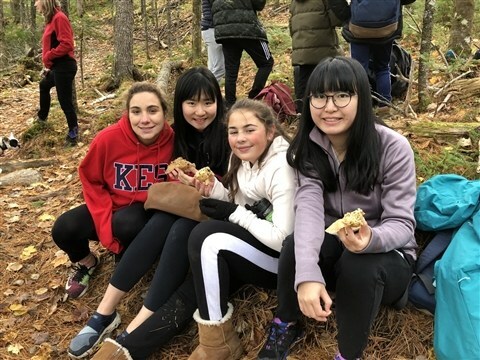 I would not have thought anyone would want to join us but we have had Brisnel and Righo, Montse and Lindsay, Eva and Andrea, Linus and Mr. Dietrich (just to name a few). The boot camp sessions are lung busting, leg burning workouts, but we are getting more and more students out every night. Most nights we have 20 to 30 participants! The Girls’ Hockey Team is raising money for, and awareness of, Breast Cancer with a Pink in the Rink event. (They play at 5:00pm on Saturday night in Brooklyn.) The last I checked they raised almost $1,000 yesterday through their bake sale and dress down day. Wow! One of this week’s happy surprises was to learn that not only will we be able to dress almost the entire School in Cadet Reds (see the photo below of everyone assembled on the Field of Payne! ), but that our Colour Party and Honour Guard opened the Canadian National University Rugby Championships at Acadia last night. Our RSM Sophie Fraser was in command and she had the packed stadium silent (5,000 people) and at attention for the opening ceremonies! It was a proud moment for all our alumni, students and staff present.